Wisdom of Life. : Roses are for smarter women. Gentleman out there! Do you prefer an intelligent or a smart lady? I admire the intelligent one and love the one who is smart. Intelligent lady is usually outspoken, ambitious, independence, egoistic, demanding, dictating, aggressive and not entertaining. They tend to be more of taker than giver of lives. Their brains lead them to success and personal recognition. Smarter ladies are more attractive in look. They know how to draw the attention of men by their witty charm. Their smiles and twinkle of their eyes would capture men's heart. Including mine! Their bra's line and one unbuttoned shirt would stir the thought of those naughty men. On their own, they speak their mind but when they are with their men, they play without their mind. They are smart to let the men to lead and control. The men speak and they listen, their ambitions are to encourage the man to be successful, their tender care and concern melt the heart of man, they let the brain of man to dictate and control, they feel safer and comfortable to be protected by man, and his success is her glory. Yes smarter ladies are more of a giver than a taker. Thanks God! Little darling is a smart woman who has the right attitude of life. She is clever to love the man she loves. 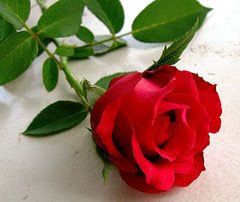 SMART is with a heart,pls giv her a red rose today bro, I am sure she will love it. The beautiful Rose for little darling is posted today for the whole world to know. She is definitely a smart lady like you, she will love it. Has Ching Ai given his Rose to you my dear?